This will be short but poignant. 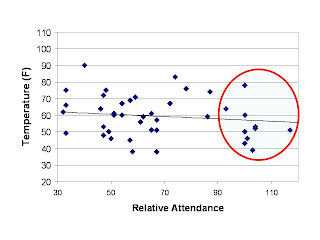 Previously, on week 5, I had done some analysis on weather-attendance correlations. Not much there. I thought maybe I would try the same but with relative attendance to put all stadiums in perspective under the same umbrella. Interesting things happen. 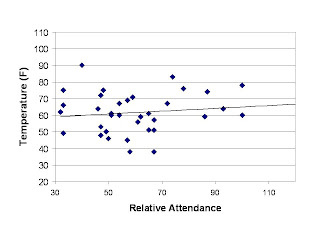 With Toronto and Seattle (attendance leaders with sellout crowds) attendance has a very slight but noticeable trend to cooler games (on right). Notice I have circled the suspect attendance figures. Some include LA but I keep those for the second analysis. So let's say we have no TFC and no Sounders. . . Trends (very slight and statistically not significant) are for warmer weather (figure on the left). I'm beginning to agree with some of the readers that the economy may be to blame. I think it's also fans of the game that are not as enthusiastic for their own teams (i.e. Dallas, Chicago, Colorado). Note that all three have their own stadium. Chicago perplexes me... they have Blanco and McBride.